After preschool Friday I stopped by Bernina Connection in search of a particular fabric. 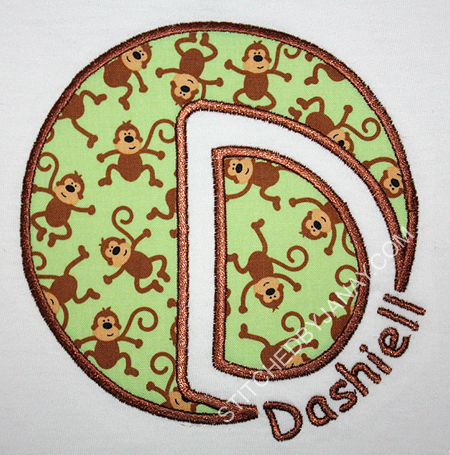 While we were there Dashiell found some green fabric with little monkeys on it and said he wanted to buy it so I could make a shirt. I told him I didn't have a project in mind for it so I wasn't going to buy any. He said (get this) that we needed to buy it now before someone else buys it. I still said no, and he continued to whine and complain about it. Kind of threw a mini-fit that sealed the deal on my "no". As we were checking out he told Lynn (store owner whom we go to church with) all about it, and described what he wanted. He was calm and rational and articulate and charming... rather convincing and totally enchanted all three women working there. I looked at Lynn and said, "I suppose I should embrace this for as long as he's interested, right?" 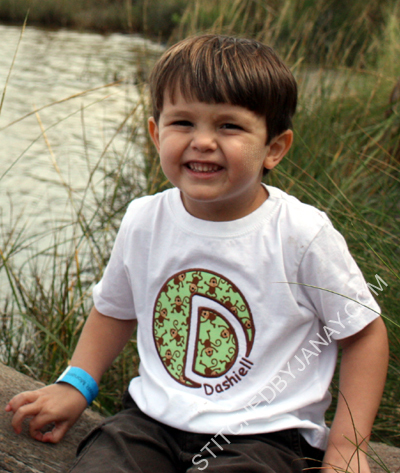 Afterall, he won't always be a three year old who wants to wear mommy-appliqued shirts. So I went back and grabbed the bolt. Well Lynn cut a quarter yard and handed it to him and didn't even charge me. Said she was partly to blame for the situation by continuing to question him about it. :) The stipulation was that he had to show her what mommy made. While he napped that afternoon (woo-hoo!) I brainstormed what kind of design I could use to show off as many monkeys as possible. You see that was part of his negotiating technique. 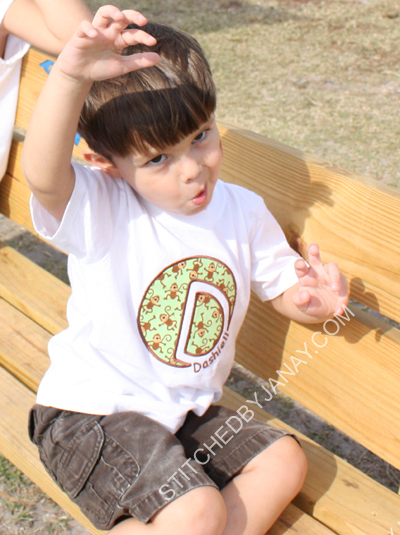 When I reminded him he already had a monkey shirt, he said, "That only has one monkey on it. I don't have a shirt with LOTS of monkeys." 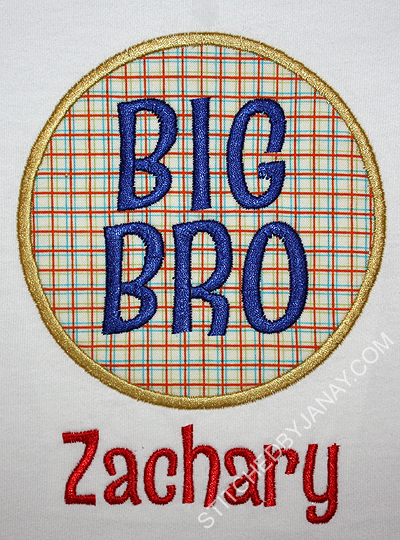 I looked through my applique alphabets to see if I had a big chunky D that would maximize fabrics, and then I remembered this cool font! This is technically the D from East Coast Applique's Baseball Alpha, but instead of using white fabric I used the monkey fabric, and I skipped the step with the red stitching across the ball. (You can see my friend Wendi's sample of the alphabet here) I added his name with Embird Alphabet #4. I really like how it turned out. What a neat way to show off cool fabric. 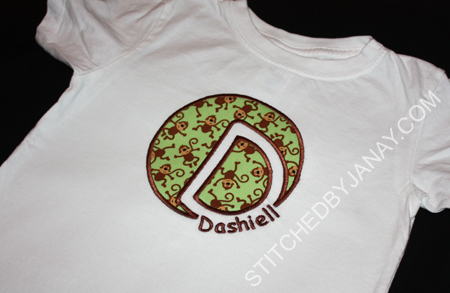 And it was a quick design -- one fabric to trim, one thread in the machine! And acting like a monkey! 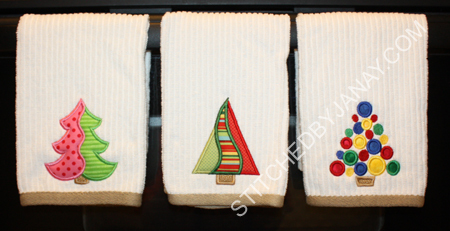 These three towels feature the 4x4 sizes of Lynnie Pinnie's new Christmas trees. 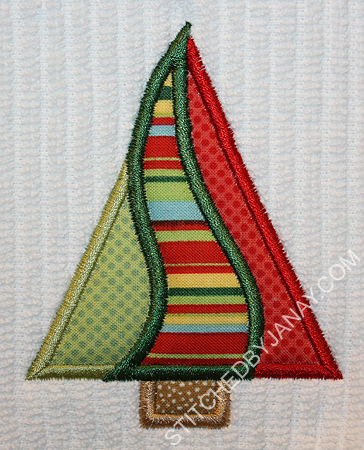 I especially love the first two with the vertical piecing, something I haven't seen anywhere! 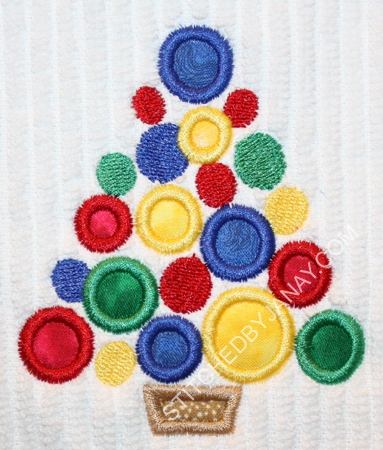 And this one has multi-color dots, Polka Dot Christmas Tree. Honestly I think this would look best with a pink/red/lime/green color scheme, but I was experimenting with making it gender neutral. 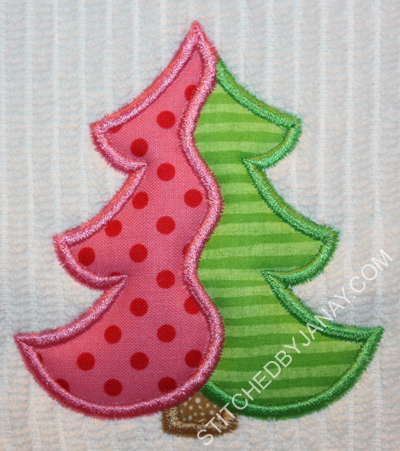 If I had time I would make Annaliese a skirt or ruffle pants out of this fabric and a matching shirt with this tree applique design. 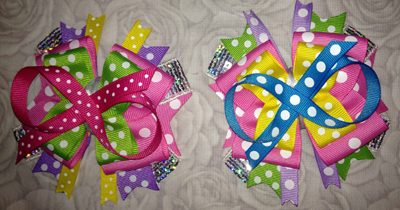 The color palette was based on these cute hairbows the girls are going to wear. Tammy sent me this picture of them (in progress) so I could do my best to match colors, cute right?? 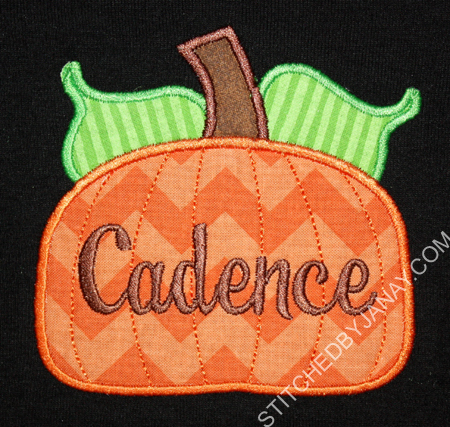 The applique numbers are from 8 Claws and a Paw's Chatty Applique, and the text is done with Candi, also from 8CP. 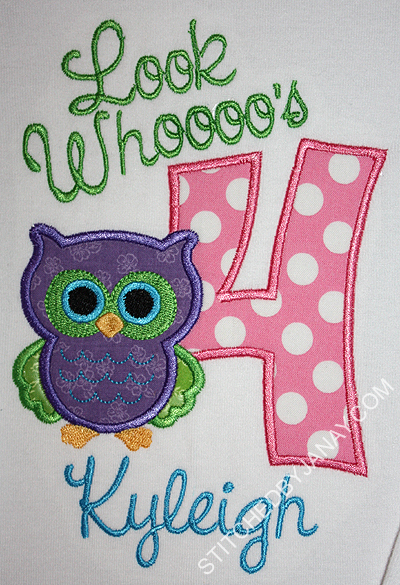 The applique owl on Kyleigh's shirt is the 4x4 Owl on a Branch design from Lynnie Pinnie, minus the branch. This is the 4" size of Box 1, and I added her name with I2S's Quirky font. I'm anxious to see the completed outfit! 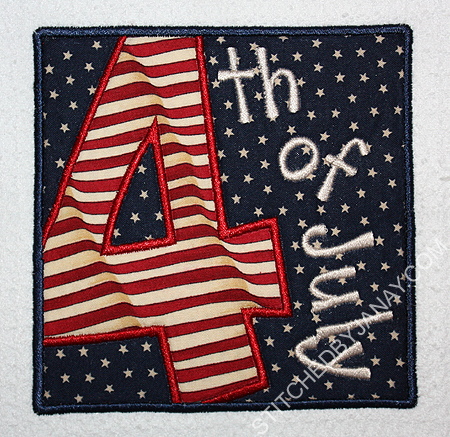 My MIL used some pretty star fabric when she tested the #5 design which made me think... could I use the #4 to make an Independence Day towel? Why yes! This is the 5" size of Box 4, and I added the text with I2S's Barnyard font. I fiddled with the placement of the text for a while, and decided this kind of tumbling/rotating effect worked best. 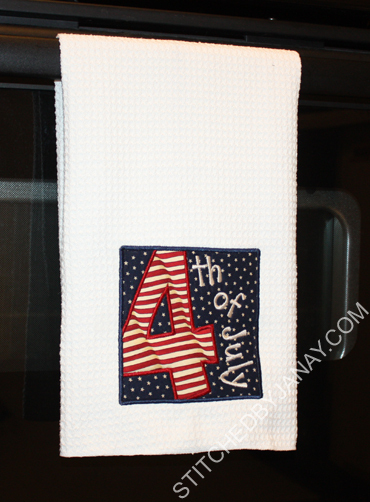 I love this waving flag striped fabric! I'm excited about this set of numbers! 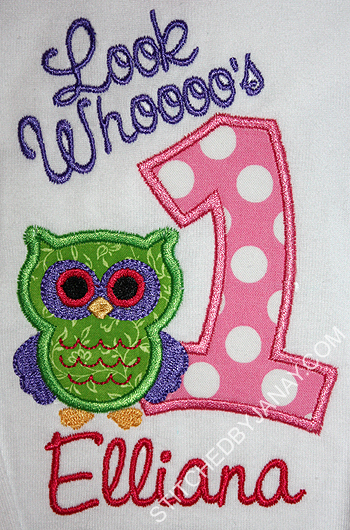 Great for birthday shirts and monthly milestones for babies. 12 days of Christmas? 12 months in a year? 7 days of creation? How else can we use it?? 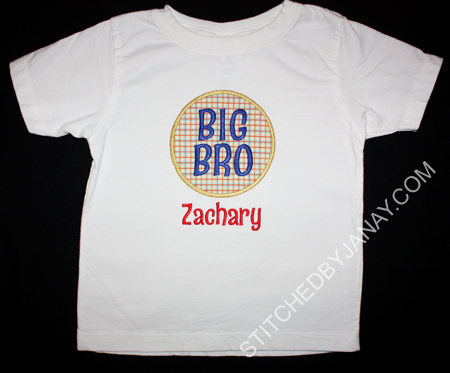 Someone is going to be a Big Brother! No, no, no, not Dashiell. After I typed that subject line I realized it might be misleading. It took me a few attempts to pick the perfect font. We wanted something easy to read, definitely for a boy, but not babyish, and bold enough to show up well on top of a print. The Pops font from 8 Claws and a Paw fit the bill! I really like this font, stitched beautifully! Three years ago (yes THREE!) 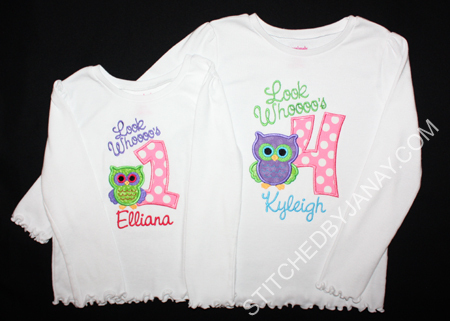 I embellished this set for my kids -- an A-line for Annaliese and a Jon-Jon for Dashiell. I added the ruffle to the RTW dress to make it a touch longer, and that enabled her to wear it the following year. And probably last year with some tights underneath. Well it was still hanging in her closet, and even at the age of 8 Annaliese just is not ready to part with it! It's basically a swing top now, so I suggested we crop off some of her jeans that she's outgrown (such long legs!) and add a ruffle. Except... 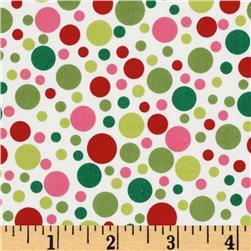 I only had a small rectangle of that fabric left! 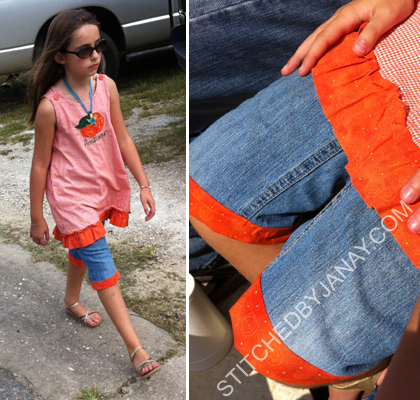 But this morning before leaving for a local pumpkin festival, I chopped off some old jeans just above a hole in the knee and added a fabric band. It worked surprisingly well! I didn't get any good posed pictures amongst the pumpkins, just an in action shot as we walked back to the car. 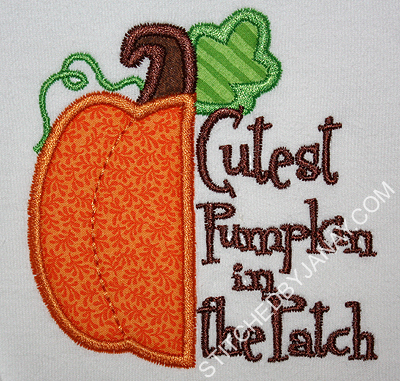 This pumpkin is from Applique Cafe. I have admired it for three years I think, and FINALLY used it. I love how it turned out with the chevron. 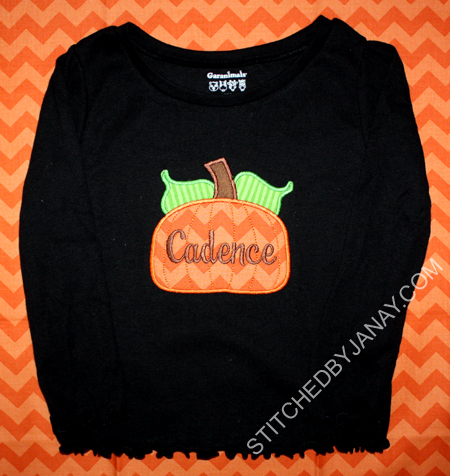 :) I added Cadence's name with the Dancer font from 8 Claws and a Paw. 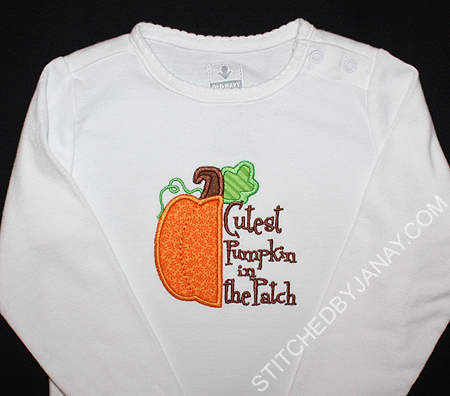 Riley is going to be the Cutest Pumpkin in the Patch! 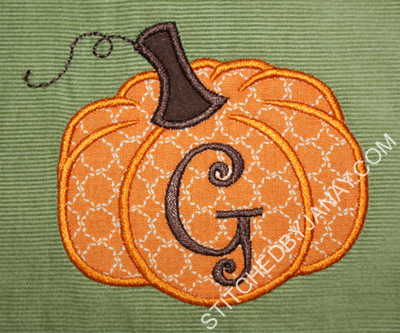 The pumpkin is from Planet Applique and I added the G using Embird alphabet #17. 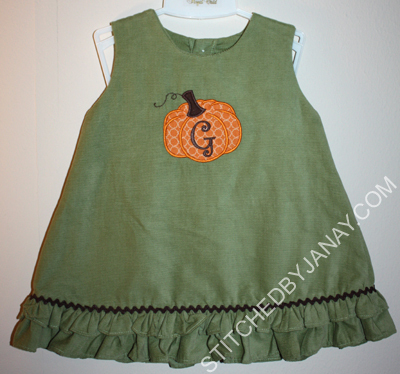 Isn't it neat how different each of the pumpkin designs turned out depending on fabric selection and style of design? Another sign of fall around here for us is spiders -- MAN we have spiderwebs all over the place, a new one forms from my car door to the fence every night! 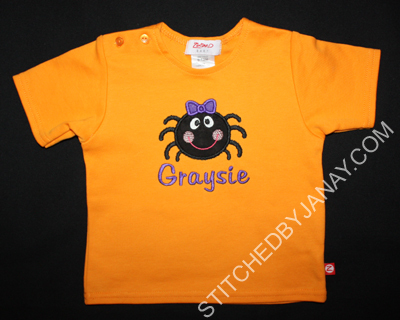 If I ever saw a cute spider, this is it, Lynnie Pinnie's Cute Girly Spider. 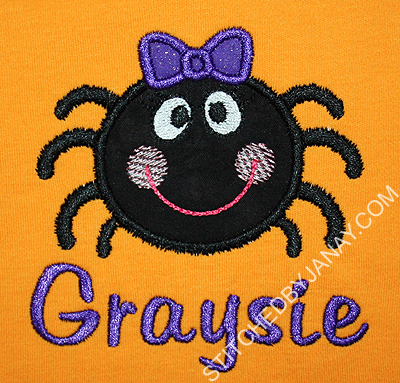 The jagged satin stitch is such a clever design element to make the spider look fuzzy. I added Graysie's name with 8CP's Dorthy. 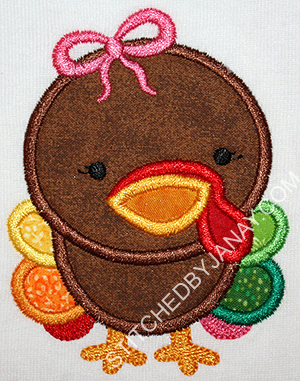 And you know Thanksgiving is coming when you start stitching turkeys!! 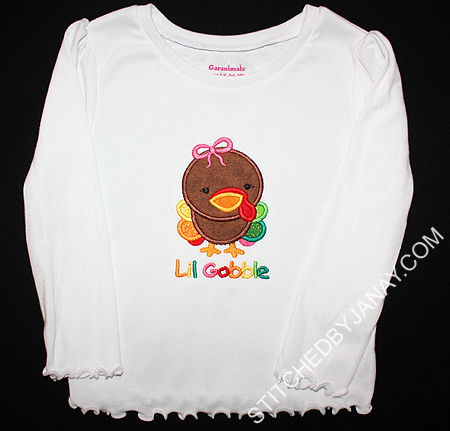 The Baby Turkey Girl applique is from Lynnie Pinnie. This is actually Cadence's second Thanksgiving, so I couldn't use the text "My First Gobble". Instead we changed it to Lil Gobble. 8CP Fonts on CD?!? YES! One year ago today I blogged about some important 8 Claws and a Paw news, and here I am doing it again today. While that post was sharing the end of their font club, this is announcing a new amazing opportunity for embroiderers! It's no secret that I love 8 Claws and a Paw fonts; if you've read my blog for 5 minutes you know I use them all the time. It's also no secret that I highly respect Joe and Julie, God-honoring people doing excellent business, and also serving God with their entire lives by responding to the call of international adoption. 8CP was originally started to raise funds for their future adoption, and it continues to be how they support their growing family! As I hang around their Facebook page one common question I have seen is if they will ever offer their fonts on CD. After about 2 months of diligent work they have announced that YES!! their 615 fonts are now available for purchase on CD!! At this moment, they are accepting pre-orders for $79.95, CDs will begin being shipped on October 10. Woo-hoo! 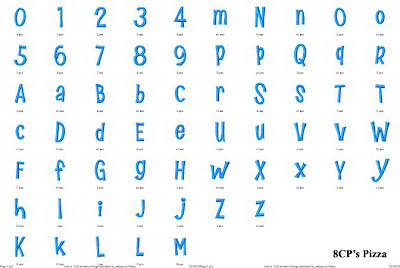 The CD also includes image files of the full alphabet for each font. This is a big deal people! 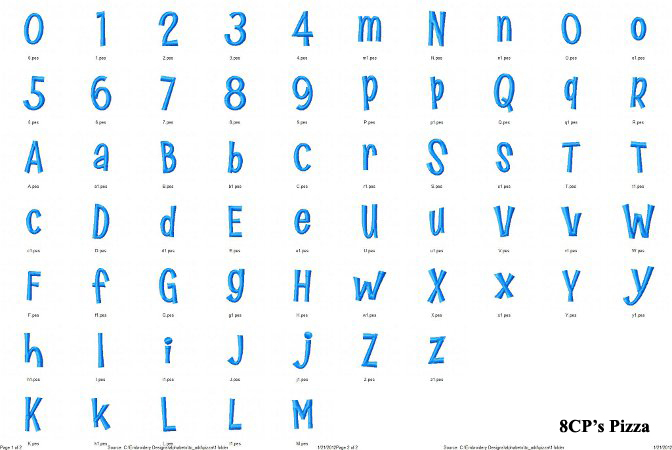 These images have always been available on their website -- before you purchase one of their fonts you can click on "additional pictures" to see the full alphabet. That feature is important to me. My initials are JT, and it is RARE for me to find a font where I like both the J and the T -- I like to see the full alphabet before I commit to using it. It was a LOT of work, but I LOVE having this this folder of font images. I scroll through it all the time! 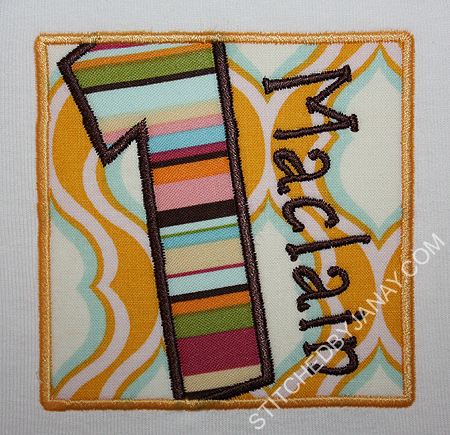 The CD also includes a brand new feature -- a file showing each letter with its dimensions and stitch count. You can see a sample on their website. This is an amazing value, and I encourage you to get it. Not only will you have a fantastic resource delivered right to your door, you will be supporting adoption! I'll let you in on a little secret. (Well, really it isn't a secret since they have announced it on their Facebook page...) Joe and Julie are in the adoption process again! Proceeds from this CD sale will fund the cost to bring their new children home! Praise God! 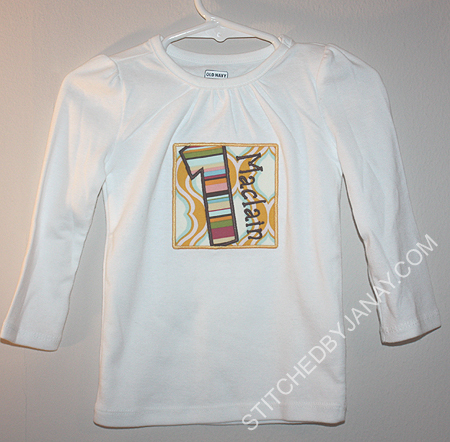 The Fearfully and Wonderfully Made design is from The Itch 2 Stitch. 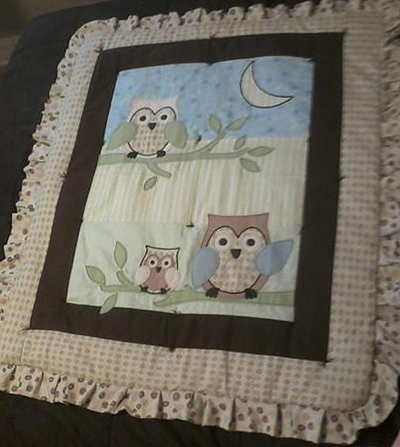 So I flew on over to my owl pinboard to see if a design already existed that would be a close match. 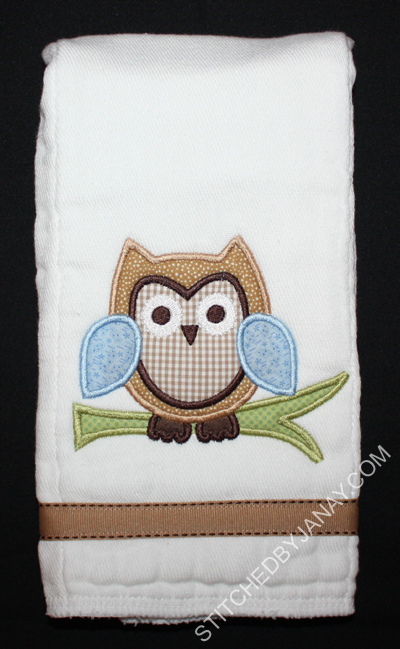 I decided to merge a couple together: I used Embroidery Boutique's Owl Branch design, but merged the wings and feet from Applique Market's Owl design. I think it will work for a boy or a girl, right? I love the personal challenge of making something to coordinate! Two of my favorite sites are having contests at the moment. And yes, I acknowledge that by promoting them on my blog I am in essence reducing my own chances of winning since maybe some of you will go enter. Oh well, I'll tell you about them anyway! DBJJ: New Release, FREEBIE, And Our First Giveaway!